Jakarta, November 27th 2014 - Set to open in early 2015 and slated to become the preferred premium budget hotel in the area, Archipelago International is introducing its Quest brand to Balikpapan, East Kalimantan. Cool, Clean and Comfy, Quest Balikpapan will combine the value of a premium budget hotel with unique, inspiring designs, creative hospitality concepts and state of the art technology aiming to be an ideal choice for travelers seeking a stylish yet unpretentious environment. The hotel is located on Jalan Jendral Sudirman right inside Balikpapanâ€™s Superblok shopping and entertainment district, which puts guests within walking distance to E-Walk, the biggest shopping mall in Balikpapan, and the city center. Inside the hotel, Quest Balikpapan will feature 79 rooms and suites, together with a restaurant, coffee shop, three meeting rooms and a spa. Balikpapan is a seaport city on the east coast of the island of Borneo, in the Indonesian province of East Kalimantan. It is the second-largest city in East Kalimantan after Samarinda, and as a coastal city, it has a number of pristine beaches including Manggar Beach, Segara Beach, Monument Beach and Melawai Beach. The city also serves as a base for nature tourism with major wildlife exhibitions nearby, like the Samboja Lestari orang-utan conservation center, the Sun Bear sanctuary and the crocodile breeding park. "We are very excited to bring the Quest brand to the bustling city of Balikpapan. The hotel will be joining our two other hotels in the area, Aston and favehotel, and it follows the most recent and successful opening of Quest in Surabaya. With the brand's continued growth across the archipelago, we believe that Quest Balikpapan will become the preferred accommodation choice for budget travelers in the city, bringing a breath of fresh air to Balikpapanâ€™s vast development." said John Flood, President & CEO of Archipelago International. 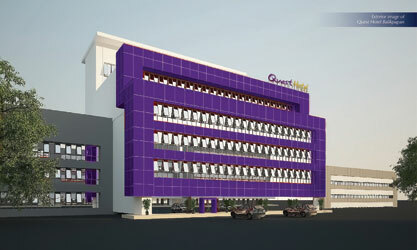 Exterior of Quest Balikpapan - East Kalimantan. Lobby Image of Quest Balikpapan - East Kalimantan. Quest Hotel is Archipelago Internationalâ€™s affordable life-style 3 star hotel brand which aims to combine the value of premium budget hotels with unique and inspiring designs, creative hospitality concepts and state of the art technology for travelers seeking a stylish yet unpretentious environment. Archipelago International is one of Indonesiaâ€™s leading hotel operators with an underlying portfolio of more than 90 hotels and 12,000 rooms. As a continually expanding brand, Archipelago International has a development pipeline exceeding 95 properties in Indonesia, the Philippines and Malaysia.